While this salad isn’t a true nicoise, which has tuna, anchovies and traditionally no cooked vegetables, I still like the name for this. It’s a main course salad and very French in style. It’s creator, Suzanne Goin, says she was inspired to create it by the salads she’d had in French bistros, so there you go. There are many different parts to this salad, so it can take a while to make in one session, but you can make the potatoes and beets a day ahead and this will make the day of cooking pretty quick. I love this salad for many reasons. 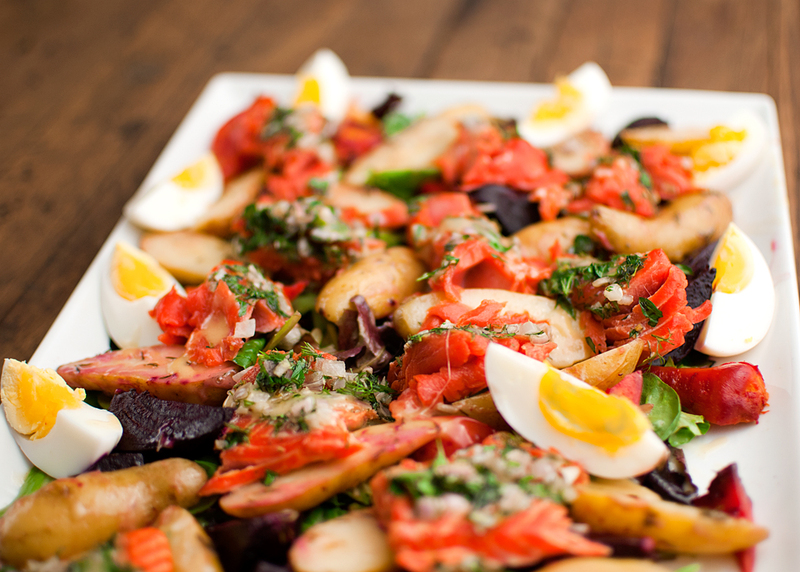 One is that it has lots of different flavors on the same plate-beets, salmon, eggs, potatoes and greens. It’s also very visually appealing and I love to ogle my food. If it looks pretty, it often tastes pretty too. This also makes it a great dish to share with friends. The salmon preparation is another plus to this recipe and one I’ve used with other dishes. It makes the salmon tender and moist in a way that I haven’t tasted in any other preparation. -Cut the greens from the beets, leaving 1/2″ of stem still attached. Clean the beets well, and toss them with 2 tbsp olive oil and tsp salt. Put beets in a roasting pan with a splash of water, cover tightly with foil and roast about 40 minutes, until tender when pierced. The actual cooking time will vary depending on size of beets, but I’ve never had them done before 40 minutes. It’s usually longer. When the beets are done, allow to cool and peel the beets by slipping off the skins. Cut the beets into 1/2″ wedges. -Once the beets are in the oven, toss the potatoes with 1 tbsp olive oil, the thyme, and 1 tsp salt. Place in a roasting pan, cover with foil and cook in the oven about 30 minutes, until tender when pierced. When the potatoes have cooled, cut them in half. 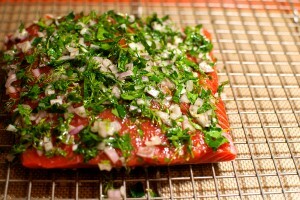 -Remove the salmon from the fridge 30 minutes prior to cooking to bring it to room temperature. -Turn the oven down to 250 degrees and place a shallow pan of water on the bottom rack. -Finely grate the zest of the lemon until you have 1 tsp. Combine the lemon zest, shallots, dill, tarragon, and parsley in a small bowl and stir in 2 tbsps olive oil. -Place the salmon skin side down and season with 2 tsps sea salt and some freshly ground pepper. Smear about half to 2/3 of the herb mixture on the fish and turn it over. Slather the skin side of the fish with the remaining herb mixture and season with the sea salt and a little more black pepper. 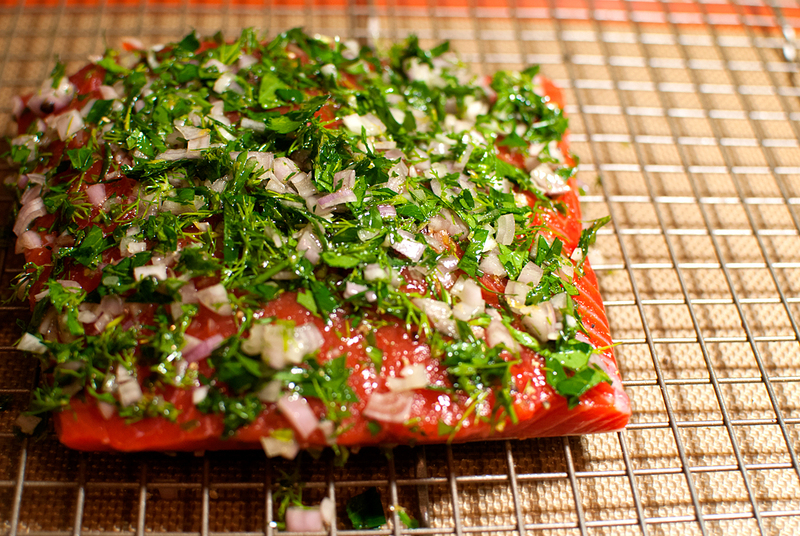 -Place the salmon on a wire rack set on a baking sheet or in a roasting pan. Bake the salmon about 25 minutes, until medium-rare to medium. The center will still be slightly translucent. To check if the salmon is done, peek between the flakes. If it doesn’t separate into flakes, it’s not ready yet. -Meanwhile, bring a small pot of water to a boil and carefully lower the eggs into the pot. Turn the heat down to low and gently simmer exactly 9 minutes. Immediately transfer the eggs to a bowl of ice water to stop the cooking. When they’re completely cooled, peel the eggs and cut them into halves or fourths, whichever you prefer on the plate. -Season the beets with a healthy pinch of salt, a pinch of pepper, the remaining tablespoon of olive oil and a squeeze of lemon juice. Season the potatoes with 1/2 tsp salt and 2 tbsp Dijon mustard vinaigrette. Taste both for seasoning. -Scatter the greens on a large platter and drizzle 1/4 cup mustard vinaigrette over them. Nestle the potatoes and beets in and around the greens. Using your hands, pull the salmon into 2″ chunks, tucking them throughout the salad. Spoon another 1/4 cup vinaigrette over the salad, and tuck the eggs in and around the other ingredients. Season the salad with a healthy squeeze of lemon juice and pass the rest of the vinaigrette at the table. Whisk the egg yolk in a small bowl with the mustard, red wine vinegar, lemon juice, 1/2 tsp salt, and a pinch of pepper. Slowly whisk in the olive oil. (I often use less than what’s called for here, just taste to be sure you like the flavor and stop when it tastes right to you) Thin the vinaigrette with 1 tsp water or more if needed. Taste for balance and seasoning. This entry was posted in main dish and tagged salmon.